According to the UK’s Health and Safety Executive (HSE), slips trips and falls cost 40 workers their lives in 2009. Year in, year out the figure is often higher than this and falling from height is the number one cause of fatalities in the workplace. It is estimated that this costs society as a whole in the UK approximately £800 million per year. It is well known by health and safety professionals that slips, trips and falls account for around 50% of all workplace accidents. While it is true that you are less likely to have a fall from height in an office, it is by no means improbable as anyone who has tried to change a light bulb while standing on a swivel chair can testify. This can be no less dangerous than falling from scaffolding or a roof, as striking your head on a desk or cabinet can lead to a fatal injury. Indeed, the working at height regulations 2005 state that there is no safe height to fall from –and I would fully endorse this. Slipping or tripping has no preference when it comes to the workplace and all workplaces constitute a risk. I have personally known many accidents related to slips and trips. The operative clambering over weak or broken pallets, packaging and binding wire left lying about. That pool of oil that has dripped from mobile plant or leaked from storage tanks, all are potentially an accident waiting to happen. The Management of Health and Safety at Work Regulations 1999 requires companies to assess the risks associated with slips, trips and falls and then take action to prevent accidents. One of the best ways of preventing slips and trips is to implement a ‘clean as you go policy’. Many years ago on the steelworks where I worked, engineers, mechanics and fitters would attend breakdowns or replace machine components and leave the detritus of their operation behind them. Slowly and surely with the introduction of a health and safety committee and the inclusion of all departments in the health and safety process, we began to tackle what was quite a serious problem. It wasn’t without its teething troubles, as getting people to take ownership was not without its difficulties, but ultimately good practise began to become commonplace. This was the mid 1970s, the Health and Safety at Work Act 1974 had just come in and years of ingrained bad practise were not going to be eradicated overnight. There was also a pecking order in those days and the maintenance crew simply did not clean up after themselves – it wasn’t the done thing. Now with toolbox talks, leading by example and a sound policy with an equally sound safe system of work promoting a positive health and safety culture, all workplaces should be able to achieve exemplary results with regard to all aspects of health and safety in the workplace. The Health and Safety Work Act 1974 requires all employers to provide a safe place of work for their staff, contractors, agency workers and the general public. The Workplace Regulations 1992 state that floors must be suitable for the type of work carried out in certain premises, and be free from obstruction so that people can move around safely. Floors should be appropriate to the conditions and work carried out, they should be cleaned as necessary and maintained in good condition. 2. The surfaces of the floors, walls and ceilings of all workplaces inside buildings shall be capable of being kept sufficiently clean. 3. So far as is reasonably practicable, waste materials shall not be allowed to accumulate in a workplace except in suitable receptacles. Within the same work area it may be necessary to implement different floor surfaces to combat different slip hazards. This is particularly true where foodstuffs are stored and prepared, or at a location where machine oil may be present. Floors should be part of any inspection process. Regulation 12, Condition of floors and traffic routes carries further relevant information, listed below. 1. Every floor in a workplace and the surface of every traffic route in a workplace shall be of a construction such that the floor or surface of the traffic route is suitable for the purpose for which it is used. 3. So far as is reasonably practicable, every floor in a workplace and the surface of every traffic route in a workplace shall be kept free from obstructions and from any article or substance which may cause a person to slip, trip or fall. 5. Suitable and sufficient handrails and, if appropriate, guards shall be provided on all traffic routes which are staircases, except in circumstances in which a handrail can not be provided without obstructing the traffic route. Some of the workplace areas that need special consideration are entrances and exits, steps and ramps, platforms and gantries and especially scaffolding and construction sites. Lighting should be good in all areas as poor lighting can be a contributory factor in any accident, as can weather where people are working outside, or rain ingresses into loading bay areas. Slips occur when the foot loses contact with the floor surface. This could be attributed to loose mats, inappropriate footwear or spillages of liquids. All spillages should be cleaned up immediately, or at least confined behind barriers until a cleaning process can be carried out. Specialist spill response kits may be needed in some instances where chemicals and oils are present. Training must be carried out prior to anyone attempting to clean up such materials and substances. Spillages are not necessarily confined to factories or warehouses. Offices can quite easily be subject to spillages, particularly around the kitchen area, or at water fountains. In workplaces where slippery surfaces may be prevalent due to the type of work carried out, it may be necessary to issue non-slip, low friction safety footwear in addition to specialist flooring. In some places it may be necessary to issue different types of footwear to deal with the different types of hazards that may be present within the same premises. This should be identifiable from your risk assessment. Some of the most common reasons for trips are temporarily running cables across floor ways without appropriate cable covers or signage. This may be a hazard when portable power tools are in use. Uneven surfaces or stairs can contribute to slips, as can objects left lying about on the floor. Even an open drawer, bag or a box of photocopying paper can constitute a hazard if left in the wrong place in an office. 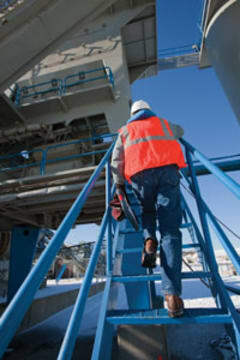 The Work at Height Regulations 2005 came into effect on April 6, 2005, and placed detailed and stringent requirements on employers and those controlling the work of others at height. These regulations also cover injuries from falling objects. As I said earlier, there is no safe height to fall from and severe injury or worse can take place from even the lowest level. Anyone who is required to work at height should be trained and competent to perform the task at hand. Any equipment that is selected and used must be suitable and appropriate. A thorough system of checks should be carried out on a regular basis to determine that any equipment is in sound and serviceable condition. Ladder registers should be used and a competent person should carry out regular checks and record the findings. I would always give consideration to using aircraft style steps wherever possible. Any ladder that is deemed to be damaged or unsafe should be taken out of service immediately. It is my experience that in many instances if a worn ladder or steps are not removed completely from the workplace, then some people will still attempt to use them regardless. Likewise, a trained and competent person should make regular checks on scaffolding. I would give due consideration to a tagging system to record dates and times of checks –a system which can also be used for ladders. All working at height must be thoroughly risk assessed before being undertaken by trained and competent personnel. The Work at Height Regulations 2005 applies to all work at height where there is a risk of injury from falling. It also covers injuries from falling objects. You can be deemed to be working at height at ground level or even below the ground. An example of this could be where there is a drop from a loading bay, or perhaps an embankment. As a rough guide you can deemed to be working at height anywhere it is possible to fall from. 1. So far as is reasonably practicable, suitable and effective measures shall be taken to prevent any event specified in paragraph 3. 2. So far as is reasonably practicable, the measures required by paragraph 1 shall be measures other than the provision of personal protective equipment, information, instruction, training or supervision. What follows is a case study which illustrates the cost of non compliance, where two companies were fined after a worker broke his back in fall. A packaging company and an engineering company based in Cambridgeshire were fined a total of £68,030 with £37,743 costs after a 24 year old worker broke his back in a fall from a roof void. A pipe fitter employed by a subcontractor at the time, was tasked to install pipe work required for the installation of a moulding machine at a packaging company’s premises on October 29, 2008. Part of the pipe work installation was taking place in the roof void above a suspended ceiling, a distance of 6.5 metres to the factory floor, and required that the pipe fitter and a co-worker use a crawl board to travel from the protected walkways in the roof to the place where the pipe work was to be installed. Both men had harnesses but they were unable to use them effectively due to a lack of suitable attachment points in the roof void. At times, both men had to detach themselves completely to move across the void to the work position. The fitter was using the crawl board between beams in the roof void to traverse to his working position when he fell to the floor, suffering fractures to his spine, skull and ribs. An investigation by the Health and Safety Executive (HSE) found that despite the fact that some measures were taken to assess risk, and some work at height equipment was provided prior to the work being carried out, both companies had failed to ensure that the pipe fitter and his co-worker were competent to undertake work at height and given appropriate equipment and a safe system of work. The two companies appeared at Cambridge Crown Court. The packaging company admitted breaching Section 3(1) of the Health and Safety at Work etc Act 1974. The engineering company admitted breaching Section 2(1) of the Health & Safety at Work etc Act 1974 and Regulation 5 of the Work at Height Regulations 2005. The packaging company was fined £50,015.00 with £29,291.09 costs, while the engineering company was fined £18,015 with £8,452.63 costs. Working at height does not have to involve unacceptably high risks. Proper management of any task that involves working at height will create a safer working environment for everyone and help you to comply with your legal duties. Take the time to plan the work, select the right equipment, and use it properly. As with working at height, the use of risk assessment, implementing a safe system of work and regular inspections will also go a long way to ensuring your staff don’t become victims of the slips, trips and falls statistics.